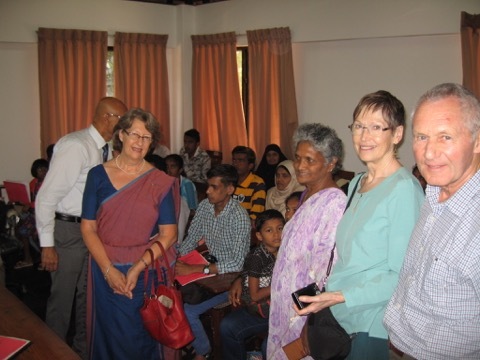 Project Sri Lanka commenced a new area of support in 2017, this being for the Department of Oral and Maxilofacial Surgery at the Faculty of Dental Sciences at the University Hospital in Peradeniya, Kandy. In 2017 we commenced a major two year project concerned with awareness, detection and treatment of oral cancers. This project is being carried out by surgeons of the hospital department and Cancer Care Services in Kandy. It is the recipient of a Rotary International Global Grant. Project Sri Lanka is a major donor in association with the Rotary Club of Kandy and the Rotary Club of Alnwick, UK. The project involves the conduct of field camps by volunteers of Cancer Care Services, particularly in areas of the country such as hill country tea plantations, where workers habitually chew betel ‘quids’ which contain carcinogenic substances including areca nut, tobacco and slaked lime. Any individual found with pre-cancerous lesions or developed tumours in referred to Peradeniya for diagnosis and treatment. The project also involves an island-wide awareness raising programme for schools in the hope that it may have positive impact on the young and they will be encouraged not to start the betel chewing habit or smoking. Ongoing reports in 2018 suggest that the project is having significant impact and that numerous referrals have been made; also that TV infomercials are having a crucial educational impact.